get this new Interview with Lorna Luft as an addition to the G2.net fan experience. Which was your favorite scene to shoot? Everything at the bowling alley. Were there any off screen romances and who would you say you bonded with the most while filming? We all had significant others; husbands, wives, partners and we all remain friends to this day. Was Adrian a good kisser? Did you have a secret crush on anyone during filming? How was the atmosphere on the set? GREAT! A lot of fun and hard work. We know that you and Adrian did some work together after G2. Were you guys close and do you still keep in touch? Yes we do. We both have beautiful children around the same age and I love Adrian as a person. What was your relationship like with Pamela? Did you feel protective of her? Did you guys do any background work on your relationship and/or what the Rebchuck family may have been like? Pamela is a very gifted actor who I adored working with. She was so wonderful, very funny and just a joy to work with. Most people have the attitude that Johnny settled for Paulette once he figured out he couldn’t get Stephanie back. However, based on Johnny and Paulette’s interaction during the luau and graduation scenes, it seems that Johnny realized that he and Paulette were a much better fit and he finally left Stephanie behind. Was there an intentional approach on the set to this issue — or in your own personal preparations? If not, do you have any views on it now? To be honest, I don’t remember. Sorry. Did you audition for other roles or did you want to be Paulette? What was your favorite of Paulette’s outfits? The “Girl for All Seasons” costume. Were you allowed to keep any of the props, costumes etc. after filming was done? What is you favorite song from the movie? The couple pairings for this movie worked really well. Each of you had great chemistry! Do you think Paulette and Johnny would have stayed together after graduation? I would like to think so but you never know. What do you think your character would have done after graduation? She attended a city college for 7 months then dropped out to become a groupie for The Beach Boys. She ended up married to the tour manager. Just getting the role of Paulette was a great day for me! 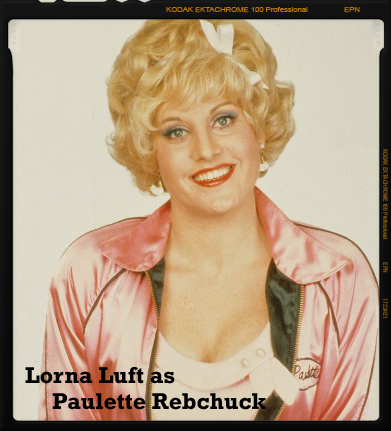 Thank you Lorna for your continued assistance in making Grease2.net a success! Thank you Adrienne for the great addition to the site! These Q&A’s may not be reproduced for use on any other website or entity. Posted with Lorna’s permission, for use at Grease2.net only. Copyright Grease2.net. ALL RIGHTS RESERVED.